Published customer image:Mouse anti Canine CD11b antibody, clone CA16.3A10 (MCA1777S) used for the evaluation of CD11b expression on canaine PBMCs by flow cytometry. 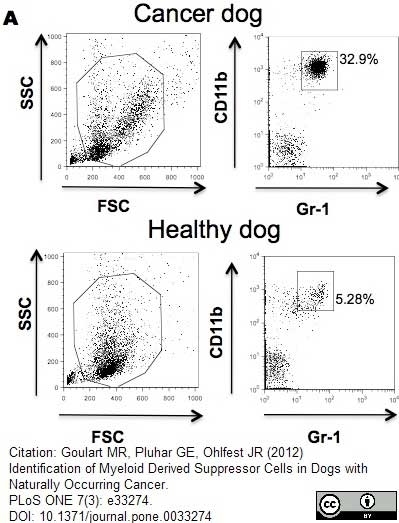 From: Goulart MR, Pluhar GE, Ohlfest JR (2012) Identification of Myeloid Derived Suppressor Cells in Dogs with Naturally Occurring Cancer. PLoS ONE 7(3): e33274. 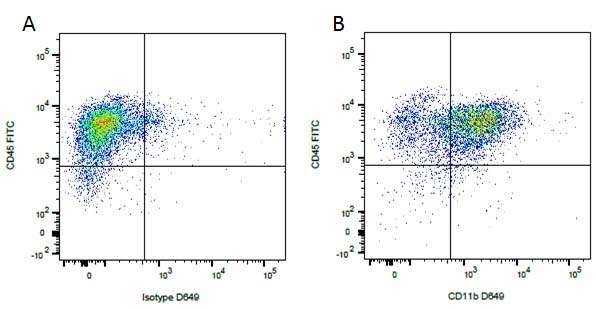 Mouse anti-CD11b and Gr-1 antibodies cross-react with canine samples. 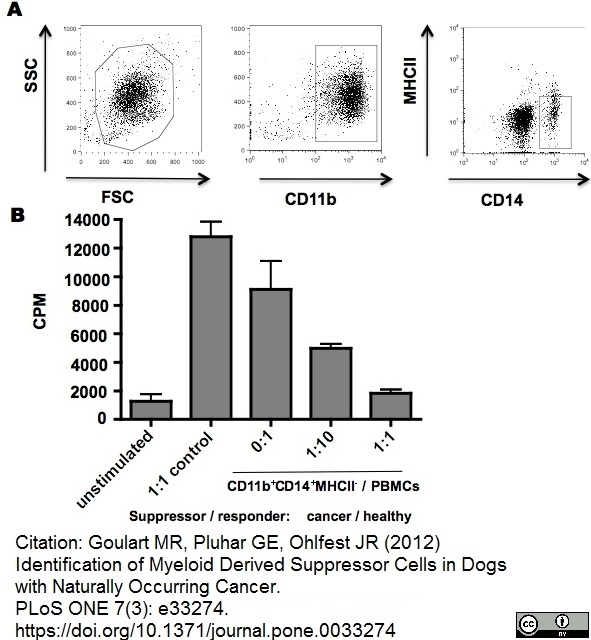 Fresh PBMCs from healthy dog and cancer patients were isolated by Ficoll, stained with anti-mouse CD11b and anti-mouse Gr-1 antibodies. CD11b+CD14+MHCII− cells demonstrate ability to suppressive T cell proliferation. 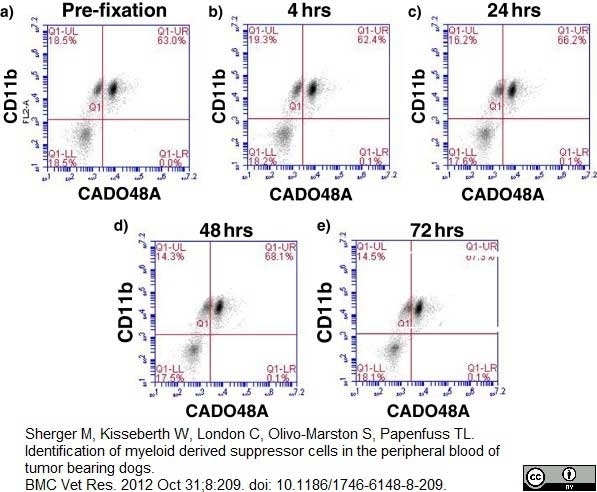 (A) CD11b+CD14+MHCII− cells were sorted from peripheral blood sample of an osteosarcoma dog (B) and co-cultured with healthy dog PBMCs in the presence of mitogen for 72 hs. Non-stimulated PBMCs were used as negative control and PBMCs co-cultured with healthy PMNs were used to control for the effect of adding cells to the assay. Proliferative responses were measured by 3H-thymidine incorporation. CPM, counts per minute. The experiment was performed in triplicate. Mean ± SEM are shown. 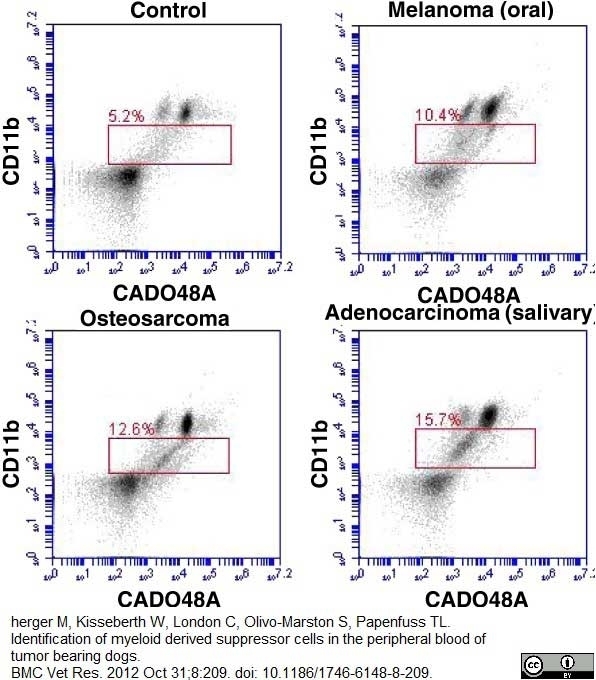 Effects of fixation on CD11b and CADO48A expression levels. 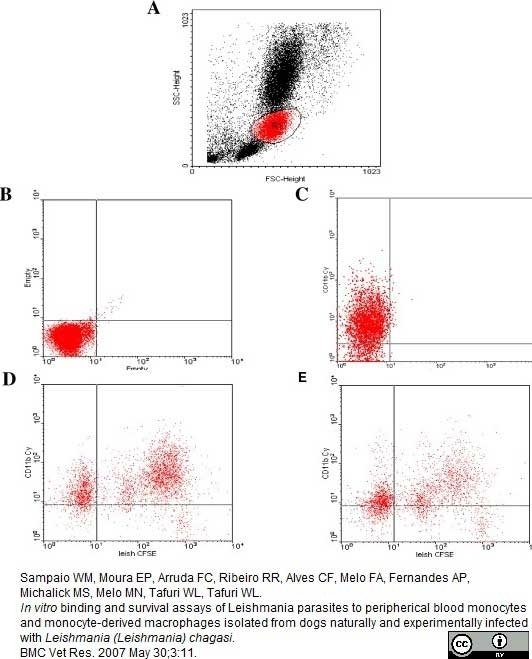 Cells were stained for CD11b and CADO48A and evaluated pre-fixation (a) or subsequently fixed with 4% paraformaldehyde at (b) 4 hours, (c) 24 hours), (d) 48 hours or (e) 72 hours post-fixation before analysis on the flow cytometer. 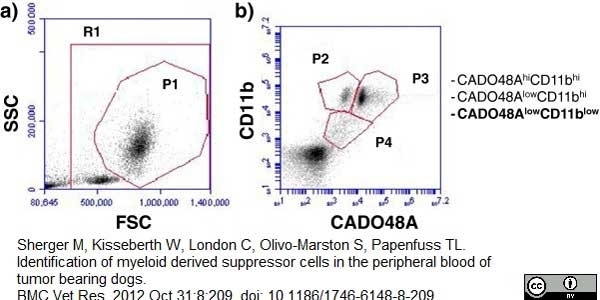 Fixation of cells appears to have limited effects on expression levels of CD11b and CADO48A expression up to 24 hours and then only mild increases of 4-6% of CD11b+CADO48A+ cells are seen at 24, 48 and 72 hours post-fixation. All cells seen in this diagram were gated on P1. Increased percentage of CD11blow/CADO48Alow in tumor-bearing canine patients. 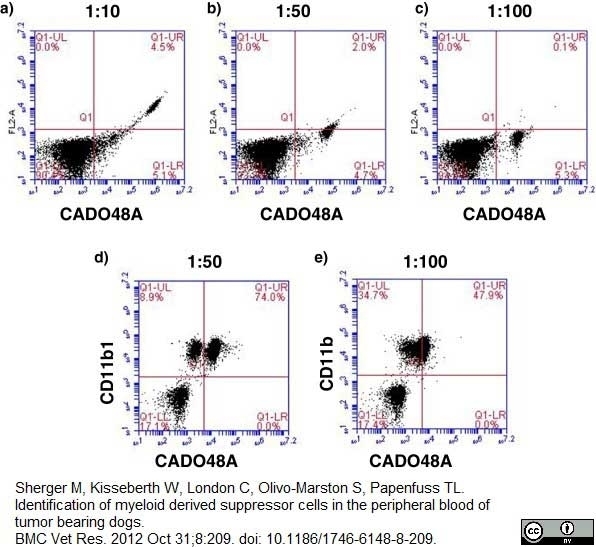 The expression levels of CD11blow and CADO48Alow was evaluated from the peripheral blood of representative canine patients and show an increase of CD11blow/CADO48low in tumor-bearing canine patients. Published customer image:Mouse anti Canine CD11b antibody, clone CA16.3A10 (MCA1777S) used for the evaluation of CD11b expression on canine cells by flow cytometry. 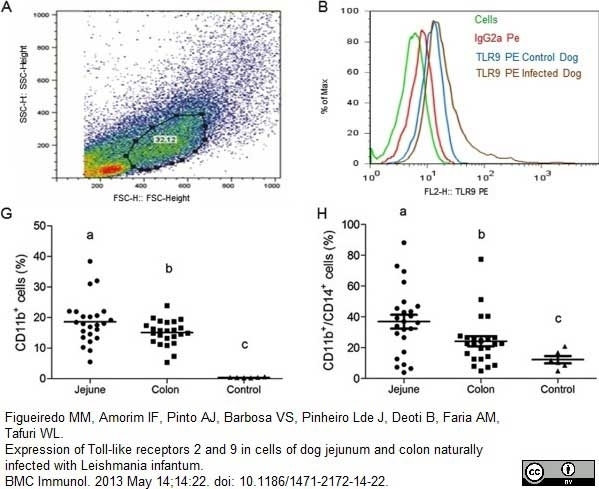 Representative gating strategies demonstrating fluorescence profiles of cells in jejunum and colon lamina propria cells in dogs naturally infected with Leishmania; (A) macrophages were identified on the basis of their specific forward (FSC) and side (SSC) light-scattering properties (B) isotype control cutoff; (G) frequency of CD11b+; (H) frequency of CD11b+/CD14+; (I) frequency of TLR9+/CD11b+; (J) frequency of TLR9+/CD14+. From: Figueiredo MM, Amorim IF, Pinto AJ, Barbosa VS, Pinheiro Lde J, Deoti B, Faria AM, Tafuri WL. Expression of Toll-like receptors 2 and 9 in cells of dog jejunum and colon naturally infected with Leishmania infantum. BMC Immunol. 2013 May 14;14:22. Mouse anti Dog CD11b antibody, clone CA16.3E10 is a monoclonal antibody recognising the canine CD11b cell surface antigen, a member of the alpha integrin family. CD11b forms one of the possible alpha chains of the canine leukocyte adhesion complexes (LeuCAMs), these contain a common 95 kDa β chain (CD18) non-covalently bound to either a 150 kDa (CD11c), 165 kDa (CD11b) or 180 kDa (CD11a) α chain (Moore et al. 1990. The CD11/CD18 complex is also known as the CR3 receptor. Canine CD11b is expressed by granulocytes, monocytes, NK cells and some macrophages. Mouse anti Dog CD11b (CA16.3E10) has been used to evaluate the effect of anesthetic administration of CD11b expression on canine neutrophils (Maeda et al. 2010) demonstrating attenuation of CD11b expression at high concentrations administered lidocaine hydrochloride and reduced adhesion of neutrophils to endothelium. Where this antibody has not been tested for use in a particular technique this does not necessarily exclude its use in such procedures. Suggested recommended dilutions are given as guide only. It is recommended that the user titrates the antibody for use in their own system using appropriate negative/positive controls. Sampaio, W.M. (2007) In vitro binding and survival assays of Leishmania parasites to peripherical blood monocytes and monocyte-derived macrophages isolated from dogs naturally and experimentally infected with Leishmania chagasi. Kamstock, D. et al. (2006) Liposome-DNA complexes infused intravenously inhibit tumor angiogenesis and elicit antitumor activity in dogs with soft tissue sarcoma. Cancer Gene Ther. 13: 306-17. Sherger, M. et al. 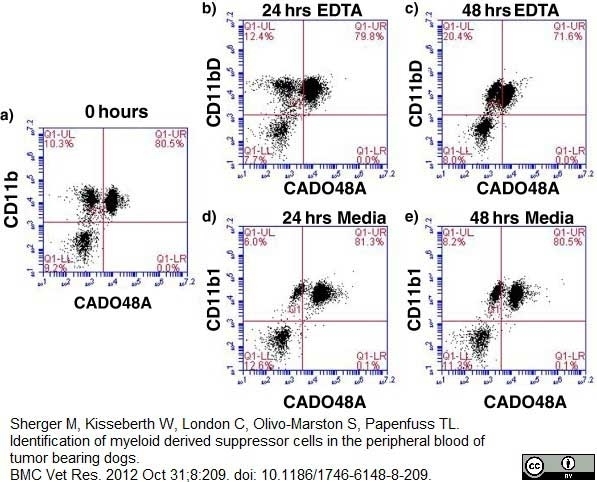 (2012) Identification of myeloid derived suppressor cells in the peripheral blood of tumor bearing dogs. BMC Vet Res. 8: 209. Gregorevic, P. et al. (2009) Evaluation of vascular delivery methodologies to enhance rAAV6-mediated gene transfer to canine striated musculature. Thompson, L.A. and Romano, T.A. (2015) Beluga (Delphinapterus leucas) granulocytes and monocytes display variable responses to in vitro pressure exposures. Kuraoka, M. et al. (2016) Serum Osteopontin as a Novel Biomarker for Muscle Regeneration in Duchenne Muscular Dystrophy. Am J Pathol. 186 (5): 1302-12. Gow, A.G. et al. (2016) Low-Density Lipoprotein Uptake Demonstrates a Hepatocyte Phenotype in the Dog, but Is Nonspecific. Stem Cells Dev. 25 (1): 90-100. Paltrinieri, S. et al. (2012) Flow cytometric detection of alpha-1-acid glycoprotein on feline circulating leucocytes. Aust Vet J. 90 (8): 291-6. Vermeulen, B.L. et al. (2013) Suppression of NK cells and regulatory T lymphocytes in cats naturally infected with feline infectious peritonitis virus. Vet Microbiol. 164 (1-2): 46-59. Guth, A.M. et al. (2013) Liposomal clodronate treatment for tumour macrophage depletion in dogs with soft-tissue sarcoma. Vet Comp Oncol. 11 (4): 296-305. Mastrorilli, C. et al. (2012) Multifocal cutaneous histiocytic sarcoma in a young dog and review of histiocytic cell immunophenotyping. Vet Clin Pathol. 41 (3): 412-8. Yu, D.H. et al. (2012) Pathophysiologic and immunologic changes in a canine endotoxemia over a period of 24 hours. J Vet Med Sci. 74 (5): 537-44. Olyslaegers, D.A. et al. (2013) Altered expression of adhesion molecules on peripheral blood leukocytes in feline infectious peritonitis. Vet Microbiol. 166 (3-4): 438-49. Wasserman, J. et al. 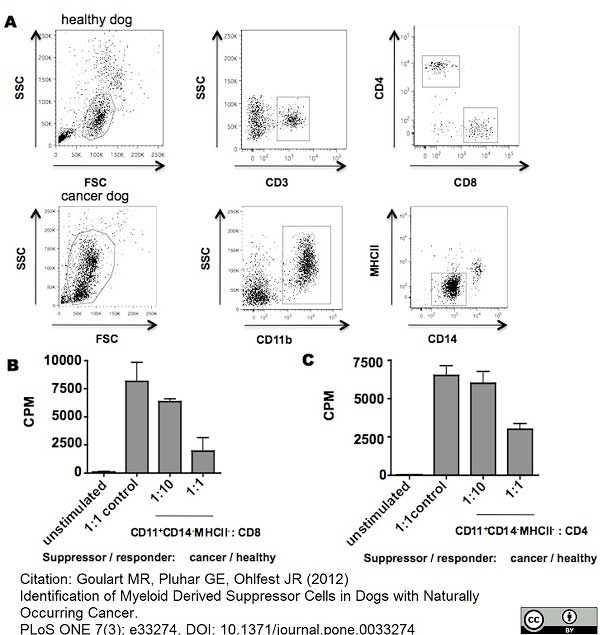 (2012) Suppression of canine myeloid cells by soluble factors from cultured canine tumor cells. Vet Immunol Immunopathol. 145 (1-2): 420-30.